Your first step of fuel oil tank winterization is an inspection. Have a professional conduct the examination to ensure accurate results. The inspector will look for anything that could impede the function of the tank. Factors that could affect the tank include leaks, water inside it, clogged filters, low fuel level and non-functioning gauges. While you have a professional out anyway, get a thorough cleaning of your tank. Cleaning your tank is a task best left to the experts. Plan to clean out your oil tank once every three years to remove any sludge that accumulates in the bottom. If you don't keep your fuel tank clean, your fuel will not flow to your home as efficiently as it should, and you could have premature wear of the tank. Regular cleaning of your tank every three years could save you the cost of buying a new tank too soon. Sludge is not the only reason to clean out the fuel tank. Water trapped inside produces rust, which eats through the container's lining and causes leaks. Sludge slows fuel movement while water corrodes the tank. Cleaning removes both sludge and water to preserve the operation and longevity of your oil tank, especially before its heavy use during the winter. Low-pressure testing: Not all tanks can have low-pressure testing for leaks done due to restrictions placed by the manufacturer. If your tank can have this leak test done, it can find holes in the pipes and the tank. The inspector will have to take the tank out of service to conduct this test, so it's best to have this service done while the weather is still warm. The inspector pressurizes the entire system with low-pressure. After 24 hours if the pressure has dropped, there is a leak in the system. Soil testing: A more indirect means of testing for leaks looks for fuel in the soil. If a leak caused oil to drip into the earth, you need to repair or replace your tank. Ultrasound testing: A technician uses ultrasound technology to take measurements of the bottom of the fuel tank in 12 places. If all readings exceed 0.10 inches, you can rest assured that the tank has no leaks. Most used tanks have measurements between 0.105 to 0.185 inches, which will suffice to pass the test. Cracks: A crack in the face of the gauge can allow water to leak inside, disrupting the accuracy of the gauge. Replace any gauges that have breaks anywhere on the surface. Loose fittings: If the gauge does not have a tight connection, it may not function as expected. Tighten loose fittings where you can. Inaccurate results: Check the gauge as you use fuel oil during the season. The gauge should reflect a decrease in the fuel level in the tank as you use the oil to heat your home. Similarly, the gauge must increase to show a full level when you have your tank filled. If the gauge fails in either case, you must replace it. Vent alarm or whistle: The vent whistle or alarm needs to work correctly. A functioning whistle will sound as the tank gets filled and stops when the oil reaches one to two inches below the top. An inoperative whistle takes minutes to replace, and it makes having your tank refilled safer than if you kept the broken whistle. In some instances, if your tank whistle does not work, you may not be able to have the tank filled. Water can severely damage your tank. Over time, even a little water can result in corrosion from the inside. Left unchecked, the corrosion will cause the tank to leak. Even a sealed container can have water in it. Fluctuations in temperatures cause condensation inside the tank, which is the source of water in most tanks. Condensation is more likely with a low fuel level in the tank. If you had a delivery of low-quality fuel in the past, water could also remain in the tank from that. Ill-fitting fill caps may also admit moisture into the tank. The oil filter canister acts like a canary in the coal mine when it comes to water damage. Check the cartridge for signs of rust or sludge, both of which indicate water in the fuel. Talk to the company providing your heating oil about adding de-watering products to your tank. Some older tanks may have more problems from using these products such as more debris getting trapped in the filter. This situation requires more frequent filter replacements. When you have your tank filled, the company doing the procedure must have easy access to the tank. 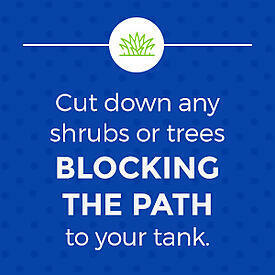 Cut down any shrubs or trees blocking the path to your tank. Keep the area free of debris that would prevent the filling company from reaching your tank. If you don't already have fencing around the tank, consider installing it. The barrier will protect your heating oil tank and lines from getting hit by yard care equipment during the warmer months. While you're making sure there's a clear path, also check the tank support. Neither the brackets nor the legs should have bends or rust on them. Replace them if you do see faults because weak spots in the legs or brackets will worsen with the added weight of the fuel oil after you have the tank filled. Remove any low-hanging branches around the tank to keep them from causing damage if they fall during winter storms. If possible, protect the tank from winds, which could enhance the effects of cold weather on the fuel, causing slow movement. Placing the tank in the lee of your home also protects it from snow and ice accumulation, which tends to build on exposed surfaces first. The accessibility of your tank and the safety of the site will ensure you don't have an interruption of service during the winter. Tank filters keep the fuel oil running cleanly into your heater. Like any filter, the job of your tank filter is to trap debris from the fuel. Change it at the beginning of the season and halfway through the winter to ensure your fuel oil has no blockages in the system. The process to change the filter requires just a couple of steps most homeowners can do without assistance. First, turn off the shutoff valve leading to the filter. Doing so will prevent oil from continuing to flow into the screen when you remove it. Remove the housing and gaskets. Discard worn gaskets. Take out the old filter and install a new one. Put the housing back on and restore the fuel flow at the shutoff valve. A sign that you need a new filter is a heater that only works intermittently. A low fuel level, clogged fuel filter or a blocked air filter could cause uneven heating. Check all these problems first before calling your service company. With just a $10 to $20 fuel filter replacement, you could save an $80 to $120 service call. If you find yourself having to replace your outdoor filter more than twice a winter, consider moving it inside. Having to replace the screen too often wastes money. It also indicates a problem with excessive buildup in the filter. When fuel gets cold, it starts to gel. The gel can accumulate in the filter, blocking it and slowing down the speed of fuel delivery. Moving the filter inside keeps it and the fuel warm, preventing the fuel from gelling and stopping wax from building up in the filter. Of course, you want to keep the tank filled throughout the winter. A full heating oil tank ensures you'll always be ready, even if a sudden storm keeps fuel trucks away. But there are other reasons to maintain a high fuel level in your tank. Consistency: A full tank prevents the surprise of waking up to a freezing home because your heating oil tank ran dry. Additionally, you won't have to frantically search for a fuel provider to come to your home at the last minute. By maintaining a consistent fuel level, you can schedule automatic delivery service to keep the tank topped off. Prevents condensation: Water in a heating oil tank poses a severe threat. Water in the tank is a greater concern than sludge. Water can create rust, which ruins your tank from the inside. A rusting tank could leak through without any outward signs. To avoid this scenario, keep the tank as full as possible to prevent condensation from forming. Condensation forms when the air inside the tank reaches the dewpoint level and condenses from a gas into a liquid. Water builds on the walls of the tank. The more air in the fuel tank, the more condensation the air can create. Reduces charges: When you have control over when you refill your tank, you are no longer at the whim of price fluctuations that occur throughout the year. With a partially-filled heating oil tank, you can wait for the fuel prices to drop before scheduling your delivery service. Reduces gelling: The higher the volume of fuel in the tank, the less likely the fuel will gel. In freezing weather, heating oil can cloud, then gel. This gelling process is normal but not ideal because it slows the delivery of fuel to your furnace. With a fuller tank, you will have less concern about fuel gelling and the subsequent problems it causes. However, a full tank is not the only thing you can do to keep your heating oil from clouding. Anti-gel fuel additives: Fuel treatment products that prevent wax and are designed for home fuel oil tanks give you an economical way of keeping your fuel flowing. For every 500 gallons of fuel in the tank, add one to two quarts of the agent. Doing so will slow the build-up of gel in your tank. Wrap up pipes: Keeping the pipes wrapped with insulation protects the lines from freezing. When you keep the pipes from freezing, you prevent the fuel from stopping. The ideal product is pipe insulation that does not absorb moisture. Most hardware stores sell this material. Manufacturers cut this type of insulation specifically to fit snugly around pipes, and you can install it in just minutes. Heat the tank: Electric heaters for fuel oil tanks protect the fuel from freezing temperatures without raising the temperature too high to create a hazard. If you're tired of losing heat from oil freezing in the tank, a tank heater may be a good option for your home. Move the filter inside: The filter is especially susceptible to the cold. Bring it inside to prevent a blockage in your fuel delivery. Switch to larger lines: If you have occasional cold spells that chill your heating oil enough to slow it, consider replacing your 3/8-inch lines with 1/2-inch lines. The extra volume the larger pipe can accommodate will allow for better movement of the cold fuel. Keeping your oil warm throughout the winter will help keep you and your family toasty and comfortable inside your home. These simple steps can go a long way toward maintaining warmth inside your home when the temperatures dip below freezing. Because part of winterizing your heating oil tank means keeping it filled, you need a reliable heating oil service. With the ease of online ordering and a discount for getting an automatic delivery service, Smart Touch Energy has what you need to stay warm. Check out our prices for heating oil delivery today.